Abstract: Orbital Angular Momentum (OAM) of EM waves open the doors for unique next generation, beyond 5G communication systems. High data rate, secure and non-line of sight communication systems in congested wireless environment, communication around impenetrable buildings and other structures, biomedical wireless sensing around sensitive human tissue, near field cloaking and interference mitigation are among the many applications of these new research investigations. Since OAM modes are spatially orthogonal, they can be used for multiplexing the data at the same frequency which would increase the channel capacity and utilize the spectrum more efficiently. We demonstrate non-diffracting Airy beams modulated with different orbital angular momenta (OAM) at mm wavelengths. It is shown that applying an azimuthal spiral phase component to the Airy beam results in a Airy OAM beam. These beams are radially symmetric with a null at the center and experience an inward radial shift within a certain propagation distance. Such a propagation dynamics is contrary to that of a conventional OAM beam where the vortex radius increases and the beam intensity decreases as the beam propagates due to diffraction effects. Thus, the Airy OAM beam is non-diffracting over an appreciable distance of few hundreds of meters and allows for high data rate communications. Phase-only spatial wave modulators are designed for generating the Airy OAM beams with OAM, L = 0, 1 and 2. In addition, the Airy beams are shown to bend and deviate up to a meter from the broadside. Secondly, we show the generation of an asymmetric far-field radiation pattern for uniform linear and planar phased arrays using excitation phases that belong to a family of odd functions. The main lobe and most of the dominant sidelobes are contained in one quadrant of the azimuthal plane, while the sidelobes in the remaining quadrants are reduced significantly by 9 dB, at least. In comparison, such an asymmetric radiation pattern is unlike a conventional phased array which produces a symmetric pattern. The asymmetrical sidelobe distribution is achieved while maintaining the main lobe intensity and beamwidth. It is shown that applying the Chebyshev amplitude modulation further enhances the sidelobe asymmetry, while also increasing the array directivity. The designed phased arrays have good scan performance from -45 degrees to 45 degrees in the elevation and azimuth planes with an ability to maintain constant directivity gain. 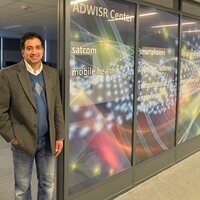 Bio: Dr. P. V. Parimi is a Director of ADWISR Center at SUNY Oswego. He has diverse experience in working for academic institutions, defense and commercial companies, as well as, small and large businesses. Prior to joining SUNY, he worked as a Senior Director at Newlans; Manager Advanced Technology at SI2 Technologies; and Senior Antenna Engineer at Cobham Defense Electronic Systems. He served Northeastern University as a Research Associate Professor and Senior Research Scientist (2000-2005). He has developed several next-gen GPS, Satcom, EW, and ISR communication and radar systems. Parimi has published more than 70 peer-reviewed research papers, filed 5 patents, and has given numerous invited talks at various industry, universities, DoD agencies, and conferences. He won as a Principal Investigator more than 20 DARPA, NSF, SBIR, STTR and BAA R&D Awards of $11M. He has been widely recognized for his research and development in wideband analog signal processing, antennas/arrays and metamaterials. Science magazine selected his research on imaging by a flat lens published in Nature as one of its breakthrough papers (Science, December 2004). The American Physical Society listed his research on left-handed metamaterials in the "Highlights of the Year 2003" (APS News, Vol. 13, February 2004). The New Scientist, American Institute of Physics News, and Physics Today have quoted him for research on EM propagation in left-handed metamaterials.